KOHLER engine identification numbers (model, specification and serial) hold the keys to efficient repair, ordering the correct parts and engine replacement. These are printed on a silver decal, which is normally affixed to the blower housing of the engine. Make a note of your engine identification numbers in your owner&apos;s manual for handy reference. 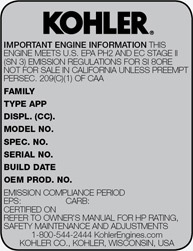 All KOHLER engines will have the decal shown below except for the XT Series, shown at the bottom of the page. Within each series of KOHLER engines are various models. Use model number to locate manuals for your engine. The specifiction number identifies specific features and variances within a model.